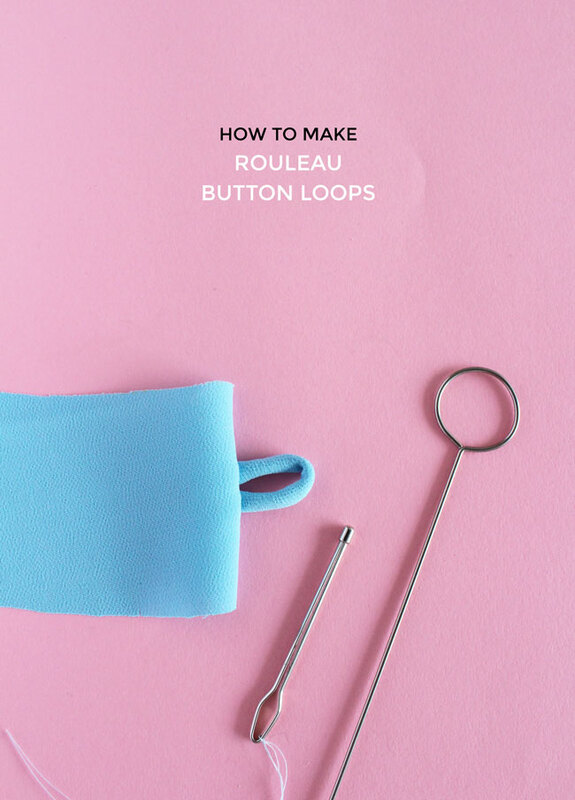 A rouleau button loop is a really pretty feature to add to your homemade clothes - whether you sew them down the front of a blouse, or just the one on a cuff, collar or at the top of a zip. 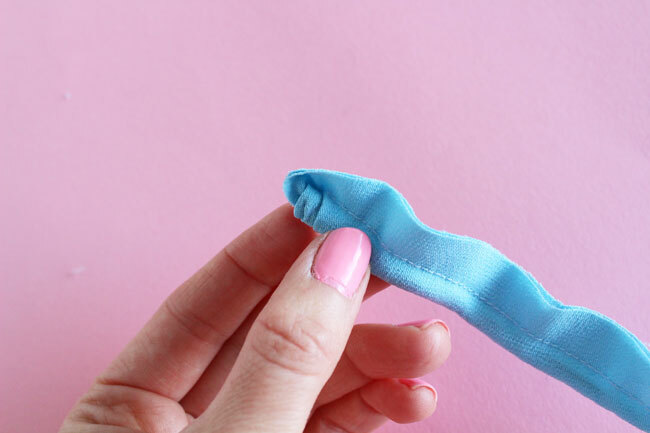 In the instructions for the Martha sewing pattern and Stevie sewing pattern, we show you how to make a cheat's button loop - using a hairband. A hairband?! Yes! 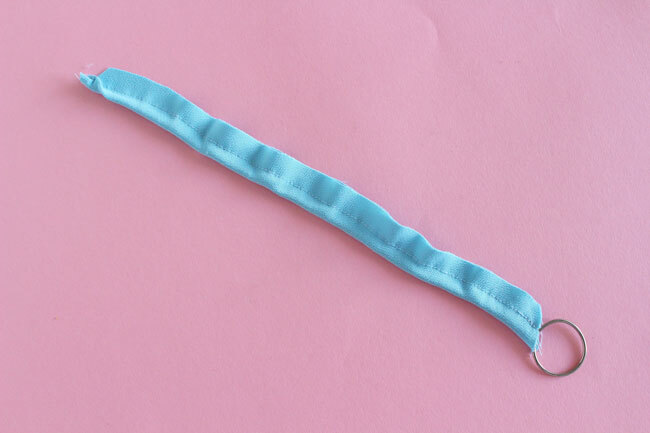 While you may not want hairbands all the way down the front of a blouse, if you need a single rouleau loop on a back neck closure, trust me on this – a hairband works really well! 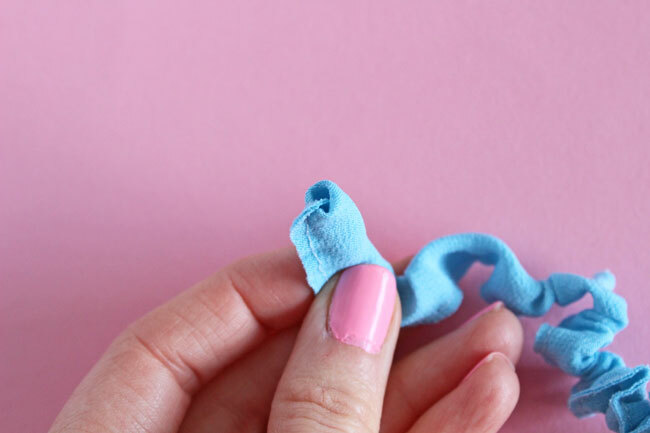 We know our you don’t all have the gadgets and gizmos you need to make occasional little details like rouleau loops – you can be resourceful and use what you already have! 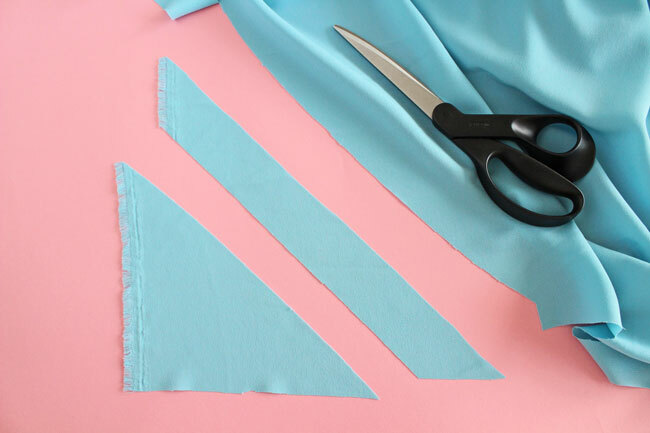 1) Cut a strip of fabric on the bias – in other words, at a 45 degree angle to the straight grain or selvedges. 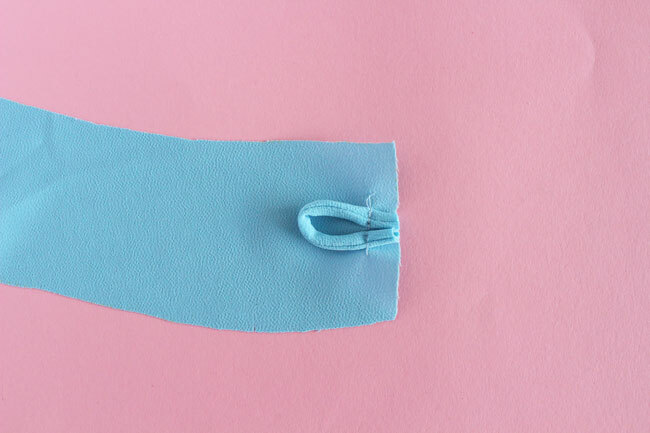 To sew one button loop with a 15mm (5/8in) seam allowance, make a strip 4.5cm (1¾in) wide by at least 10cm (4in) long. 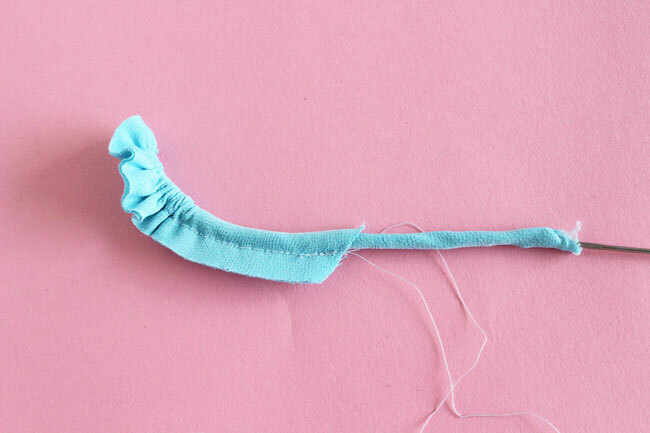 Cut it longer if you want to make more than one loop – in fact, it’s easier to sew a longer piece without it getting sucked under the needle plate, and cut it to length later. You can also play around with the width if you want a wider or narrower loop. 2) Fold the strip lengthways, bringing the right sides together. 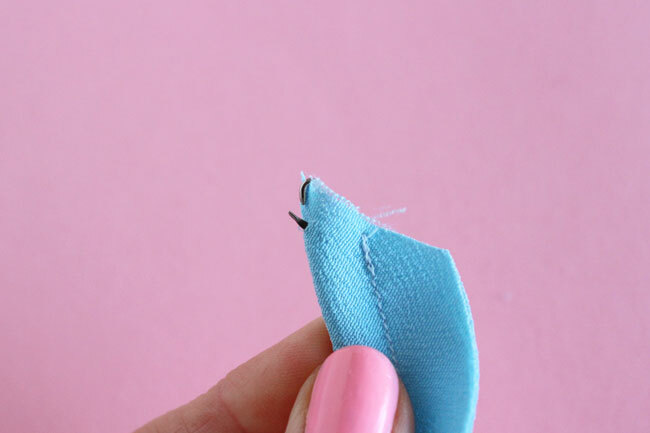 You can pin it if you want to, or simply bring the edges together with your fingers as you sew. Start sewing 1cm (3/8in) or so in from the end of the strip to avoid it getting sucked into the sewing machine. Rather than keeping your eye on the seam allowance guide, you’ll get a more even rouleau loop if you watch the folded side of the loop and keep it lined up evenly with the edge of your presser foot. Bias cut fabric can stretch and leave you with diagonal ripples. To avoid this, take care not to tug the strip as it’s going through the machine - just guide it gently with your fingers and let the feed dogs do the work of moving it along. 3) If you want a lightweight, almost flat rouleau loop, trim the seam allowances down close to the seam line. If you want a more rounded, padded out rouleau loop, trim them down by about 5mm (¼in). I love that word – “bodkin”. It sounds so medieval. Anyway, a bodkin is basically a massive, blunt needle, useful for inserting into small places without getting caught on the fabric. Alternatively you could use a large darning needle. Leave a long tail of threads at the end of your stitching. 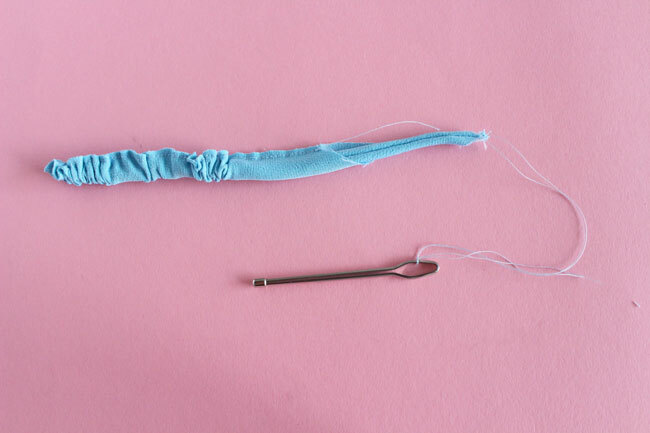 Thread them through the eye of the bodkin and tie in a double knot to secure. I find the next bit a lot easier if I diagonally trim off the end of fabric so the knotted threads are at the tip - see the picture above. Push the bodkin all the way through the tube until it emerges at the other end. 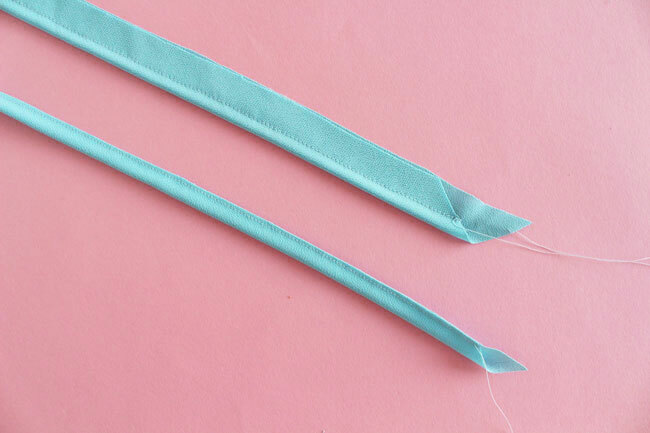 Now, pull on the threads with the bodkin as you gently roll the first end of the fabric wrong sides together over itself. This is a little fiddly - essentially what you’re doing is rolling the end tied to the threads inside the tube. Once it starts turning in on itself, you can pull on the threads to turn the entire tube right sides out. Instead of a bodkin or large needle, you could try a loop turner. This is one of those tools you either think is absolutely essential or a complete waste of money, depending on how into gadgets you are. It is pretty specific! 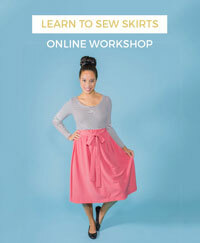 They’re particularly useful for longer tubes when you’re sewing more than one button loop. Insert the loop turner through the tube of fabric until it emerges the other end. Can you see the loop turner has a teeny hook and clasp? 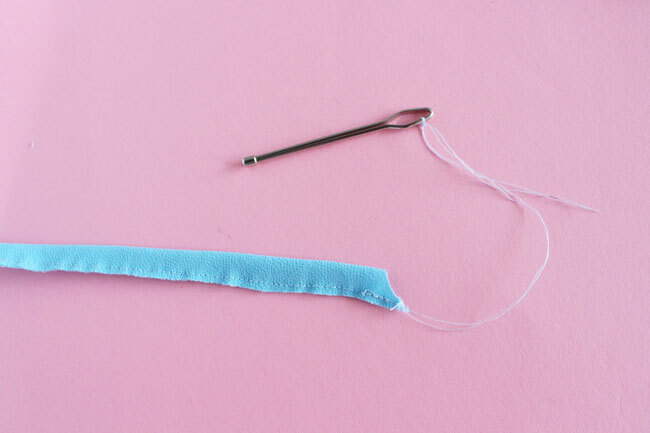 Use the little clasp bit to pierce the fabric near the end of the tube, then push it towards the hook to hold it in place. Now, slowly and carefully pull the loop turner back through the tube. 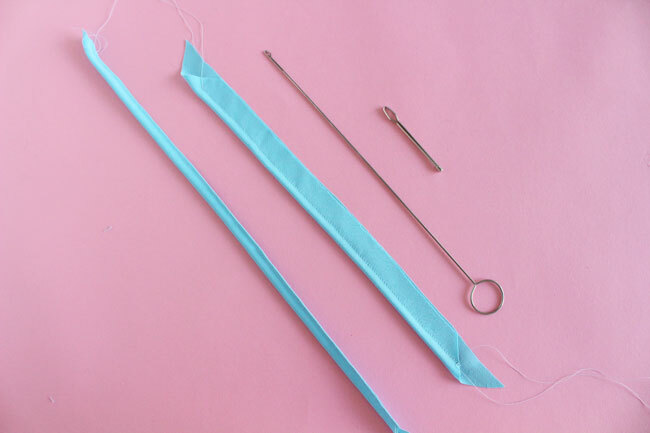 As you do so, smooth the fabric upwards towards the top of the loop turner, keeping the clasp closed as you do so it doesn’t lose grip of the fabric. Eventually it should pull the tube through itself and right sides out. Don’t be disheartened if you don’t quite manage first time (or twenty-first time, for that matter) – it’s fiddly! 5) Press the rouleau loop to neaten it up and roll the seam to one side. 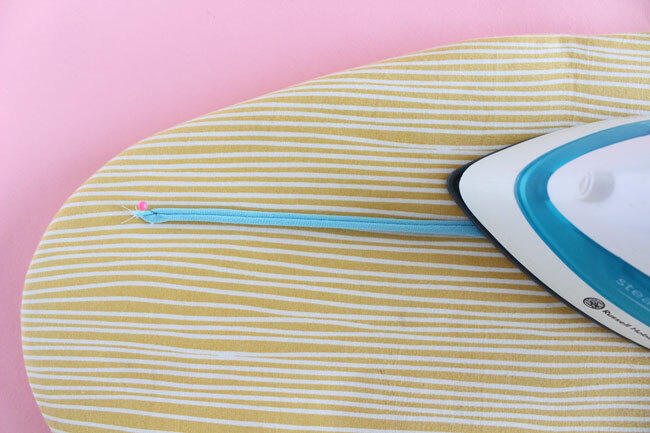 Pin one end of the loop to the ironing board and gently pull it out straight by the other end as you’re ironing it. You can either press it flat, or just steam it if you don’t want to squish up a rounded loop. 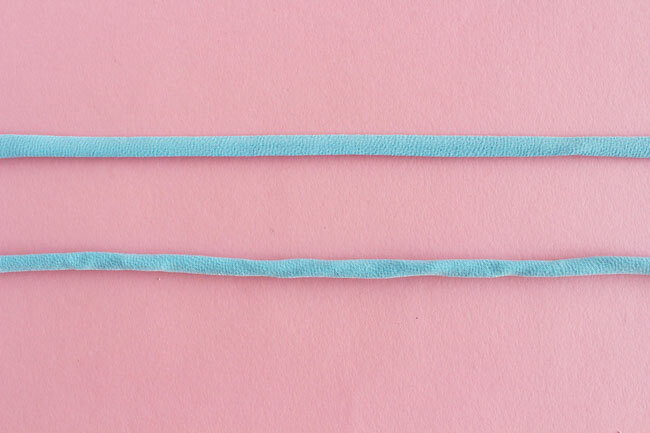 In the above picture you can see the difference between the flatter loop where the seam allowance was cut off vs. the rounded loop with the seam allowances stuffed down the inside. The latter looks a lot neater once it's trimmed and attached. 6) Cut your loop to a length that will go over and around the button and add enough for seam allowances at both ends. I’m cutting my loop to 7cm (2¾in). 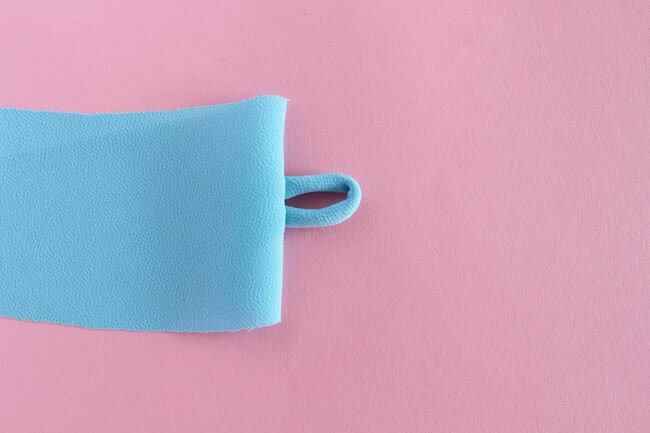 You'll want to attach the loop to the area where the closure will be before attaching the under collar, facing, or whatever piece will go on the other side of the closure. In this example, I’m stitching it to the collar on the Martha dress, where there will be a small gap between the backs of the collar. 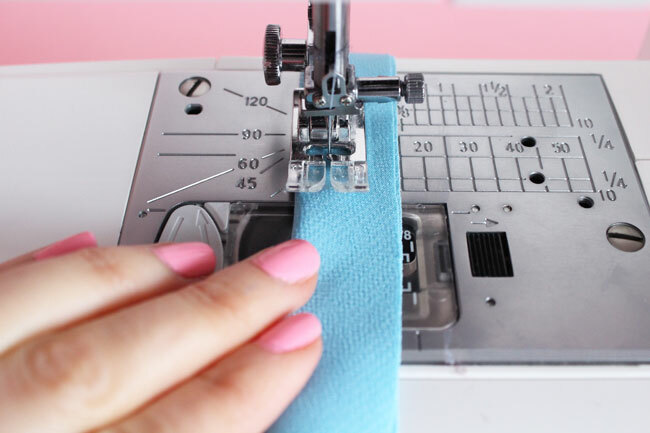 If you’re making something else, such as a blouse with an overlapping centre front, or a closure on a skirt, think about where to place the loop so it overlaps the button placement. Fold the loop in half and place it against the right side of the top collar, the raw ends against the seam allowances, the folded end towards the main part of the fabric, and the seam on the loop facing up (so it will be hidden once the collar is turned right sides out). 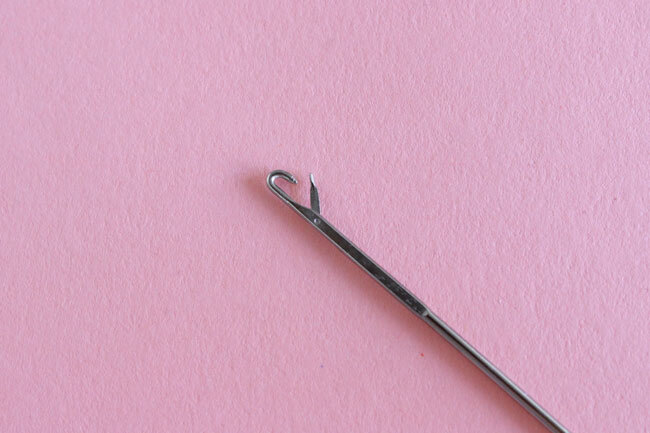 Secure it in place by staystitching 10mm (3/8in) from the edge. The loops do have a tendency to move, so you may find it easier to stitch one end at a time. 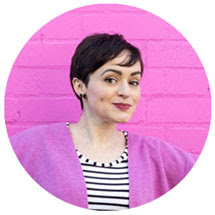 If you’re making a Martha dress or Stevie top or dress, don’t forget to share it with us – tag us on Instagram @TillyButtons #SewingMartha or #SewingStevie. Can't wait to see!